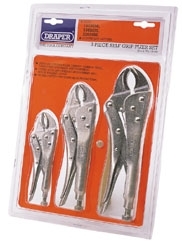 SET OF 4 CIRCLIP PLIERS. Three piece curved jaw pattern set manufactured from good quality carbon steel hardened and tempered. Serrated gripping surfaces and adjustable opening with quick release lever. Display packed.